At the ECC, we know that separation is a sensitive time for children and parents. For the first few weeks of school children attend the ECC in small groups for short periods of time, allowing them to develop relationships with teachers and classmates. Counseling and discussion sessions are available for parents and our teachers are extensively trained in handling this process. We want all children to feel safe and secure before their trusted adults leave the building. Our daily routine balances structured activity, academic inquiry, physical exercise, free choice, and quieter moments. Our interdisciplinary approach takes each child’s interests, developmental stage, and social, emotional, and cognitive needs into account. Language development and literacy, mathematical thinking, dramatic play, social skills, and artistic expression are central to our curricula. Weather permitting, children spend part of each day exploring and playing outdoors. Jewish studies are integrated into all of our programs, with regular Shabbat and holiday celebrations. We believe in documenting our students’ progress by taking notes and photographs, and studying their learning habits to guide future exploration. This becomes a vital tool for teachers to communicate learning to parents, and parents should expect to hear from us each week when we share the meaning behind their children’s work. We are eager for feedback, and intend for these communications to begin a dialogue with families. The ECC is open for 10 months of the year, from mid-September through mid-June. We observe all Jewish holidays according to Reform traditions. Our school closes for Jewish and federal holidays. 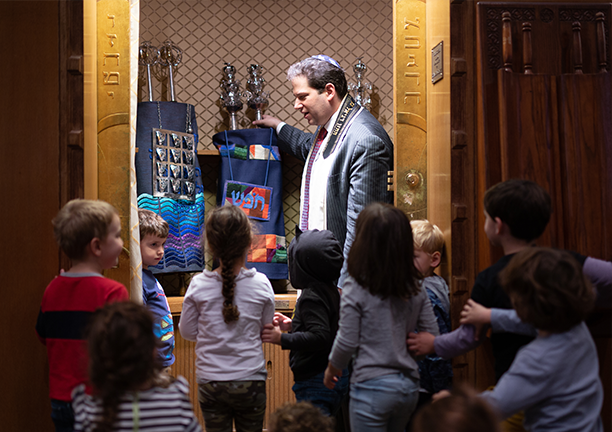 Our clergy and teachers will guide your family's Jewish journey: from joyous Shabbat and holiday celebrations for tots and toddlers to the pride of watching your child become bar or bat mitzvah — and beyond. This is where young identities and lifelong traditions take shape. Stephen Wise Free Synagogue is here to be your family's Jewish home.